Reading is such a sweet endeavor and a blessing to be sure, especially when discovering a new author. 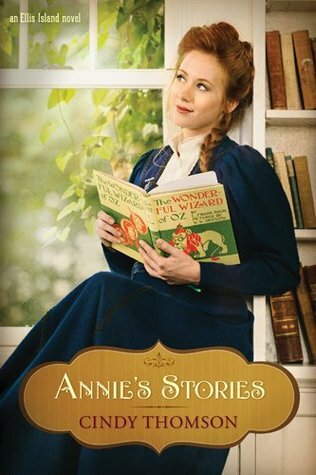 Annie’s Stories is the second book in the Ellis Island series with the first book being, Grace’s Pictures, published by Tyndale in May of 2013. Losing myself in the pages of the tale was a rich and rewarding experience. The story is rich, robust, historical, reminding the audience of what others might have experienced before us, both the good and the bad. The best part was learning even more about the book written by L. Frank Baum, The Wonderful Wizard of Oz, along with how novels and illustrations were meant to teach virtues and character traits. Annie is of Irish descent whose father loved storytelling, which I learned is a tradition steeped deeply in the Irish culture. Annie’s father dies, leaving her as she views her life all alone with no money to speak of or future in Ireland. When she is rescued from a place known as the Magdalene Laundries and their controversial history, again I was enthralled to learn more about these places after I finished the book. The story is one most people can relate to when life is viewed based on growing faith, life experiences, and love received from others. There is one character named Stephen who must learn that all he can do will never quiet the pain in his heart or soul when he loses his mother, father and only brother. Stephen comes to a place where a pastor helps him understand the choice he has before him of either to forgive or withhold and the need to listen for God’s voice or continue to try to help through his own efforts. I have not even scratched the surface of the well-researched tale written and shared with us. If you appreciate history, faith, love, and so much more, this is one novel not to miss reading or sharing with others. I plan on obtaining the other book title I shared at the beginning of this review as I believe it will be just as rewarding as Annie’s Stories.